Out of production LHW Ambassadeurs I have acquired (and used) over the years. Picked up second-hand. 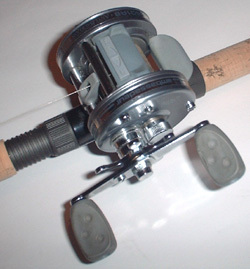 Star drag operates 'backwards' - turns clockwise to tighten - which is annoying when fishing. Handle nut has right hand thread. Did Abu simply put the gears from a RHW reel in a LHW body? 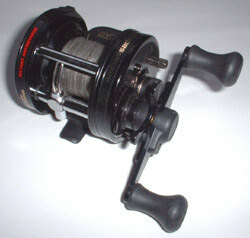 I used to use this reel for spinnerbait and jig fishing, but now it's been replaced by a 5601C4W. Another second hand deal. If only it had IAR...... 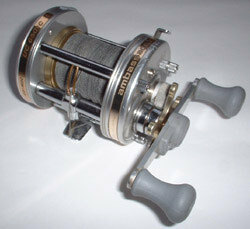 If this reel was available today with IAR I'd buy six. Well certainly four! It might be my imagination, but this is the best casting, off-the-peg, Ambassadeur I own. Pre-IAR model with Ultracast spool. Right hand side plate replaced with one from 5501C3 as the clicker switch design meant it was forever getting knocked on accidentally. Made for Bass Pro Shops in the US - graphite/composite foot, plastic levelwind shroud, soft handle knobs, Thumbar, clicker. Thumb rest removed and plastic levelwind shroud replaced with a chromed brass one. REI and REIII models were also produced in both rhw and lhw. 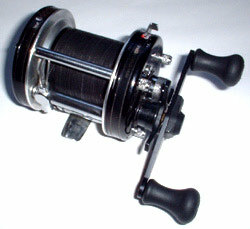 Why did I buy this reel? The best use I found for its fast retrieve was wire line trolling - to keep the line from going slack and springing off the spool. I should have got the REIII LH and fitted a new frame. Doh! Later model had soft paddle grips. Early spools have line level indicator on spool sides, but this isn't present on the later model. Thumb rest removed. I have had many years of hard work out of two of these (and two of the later models). They are dented, scratched and faded now - and the chrome is wearing off the frame of one! 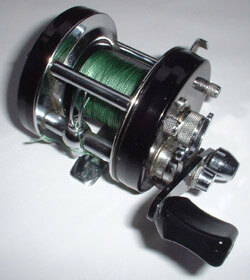 Set up correctly it is impossible to get an overrun with this reel! However, the Anti Backlash mechanism does restrict casting distance. 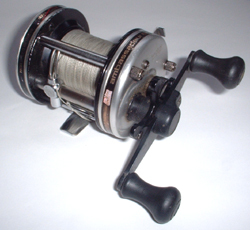 Many anglers who bought these reels, often cheaply after they were discontinued, removed the AB mechanism! 4601 and 6601 models were also produced.